These contact seals for static sealing surfaces achieve their effect through a high-enough surface pressure between the two threaded connections. 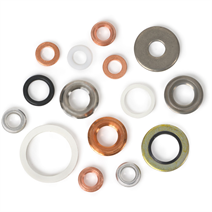 The sealings are used to seal the process connections on pressure measuring instruments at measuring points and connection components in process equipment and piping assemblies (e.g. valves, shut-off valves, syphons, connectors, overload protection devices). They prevent the accidental leakage of gaseous or liquid media into the environment. We recommend that every time a pressure measuring instrument is changed, the sealing is checked for damage or deformation and, if necessary, replaced with a new sealing.